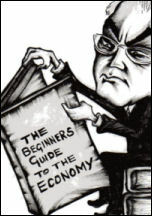 Pre-budget report: The pre-budget report marked the beginning of the 2010 general election campaign. Never before has a government tried to win an election by offering such a relentless diet of pain for the majority of the population, writes Hannah Sell, Socialist Party deputy general secretary. 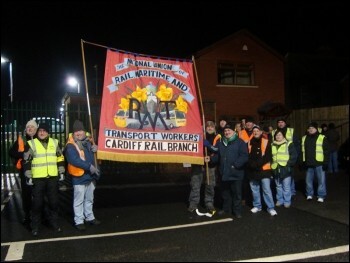 RMT signal workers are striking for a second six-day period in South Wales and the Marches in protest at attempts by management to ignore negotiated agreements, writes Ross Saunders. Academies: 'Hands off Weston Favell' wins! TORY CONTROLLED Northamptonshire County Council (NCC) has been trying to force the infamous United Learning Trust (ULT) on Weston Favell school, in Northampton, in the form of the New Labour part-privatisation academies agenda, writes Lee Dunkley. Halifax: Workers at the Metaldyne engine parts manufacturer in Halifax are set for a third day of strike action over the imposition of shift changes and threats of further attacks on terms, conditions, pensions and pay, writes Ian Slattery and Alex Whatley. Just before Christmas, low paid workers working for the private contractors Sodexo at North Devon District Hospital voted 97%-3% to take strike action, writes Jim Lowe. Members of the Transport Salaried Staffs' Association (TSSA), which represents ticket office staff within the rail industry, took strike action on 4 January as a result of a dispute with Virgin Trains management, writes Clive Dunkley, Coventry Socialist Party. Comment: IT WAS great to see the anti-capitalist band Rage Against the Machine make Christmas No.1 against X Factor winner Joe McElderry, writes Dan Crowter, Coventry. Peter Taaffe, general secretary of the Socialist Party, replies to the latest attacks on Leon Trotsky, leader with Vladimir Lenin of the Russian revolution and Stalin's foremost opponent. 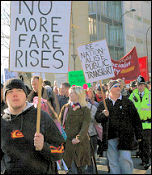 No more fare rises, no more cutbacks! South Yorkshire says: 'We want our buses back': South Yorkshire public transport users have had a double whammy this new year, with the usual annual rail fare rises coupled with the latest extortionate fare rises by First Group buses - averaging an 8% increase, writes Calvin Payne, We Want Our Buses Back campaign. THE GOVERNMENT'S business secretary, Peter Mandelson, delivered a Christmas 'kick in the teeth' to students and university workers by adding a cuts package of £135 million onto cuts of hundreds of millions already announced, writes Matt Dobson, national organiser, Socialist Students. 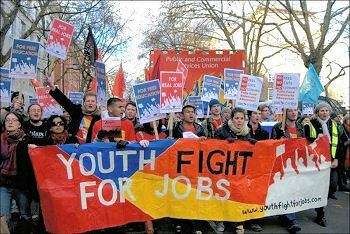 The New Year has begun with a stark reminder of the human cost of the bosses' economic crisis: young people are likely to suffer 'permanent psychological scars' as a result of unemployment, according to the newly released Prince's Trust YouGov Youth Index, writes Sean Figg, Youth Fight for Jobs national organiser. Here are some of the speeches from the Socialism 2009 rally. We hope to add more soon. These speeches can also be viewed on our youtube channel. 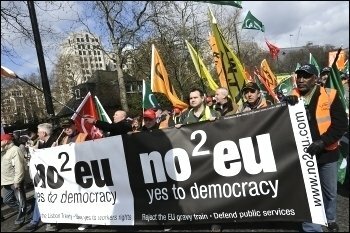 Editorial: After a series of discussions by participants in the 'No2EU-Yes to Democracy' European election coalition there will now be a general election challenge under the newly-registered electoral banner, Trade Unionist and Socialist Coalition (TUSC). Last week's crisis in the Labour leadership reveals how scared Labour MPs are of losing their positions in the general election. Two ex-cabinet ministers - Geoff Hoon and Patricia Hewitt, called for a leadership contest to challenge Gordon Brown, writes Steve Score. Robert Bechert attended last December's successful congress of Xekinima, the CWI in Greece. This article by him on the present political situation in Greece is based on discussions that took place at that congress. 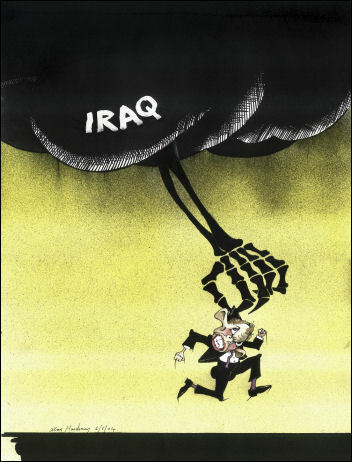 Sri Lanka presidential elections: No to the two warmongers! LAST WEEK Channel 4 TV news broadcast further video footage which appears to show Sri Lankan army soldiers perpetrating atrocities against the Tamil-speaking minority, writes Senan, Tamil Solidarity. THE JAWDROPPING seq-uence of events surrounding Democratic Unionist Party (DUP) MP Iris Robinson soliciting £50,000 from two millionaire property developers has opened a Pandora's Box of corruption. Gary Mulcahy, Belfast Socialist Party (CWI Ireland), reports. Want a job? Fine, but don't expect to be paid! 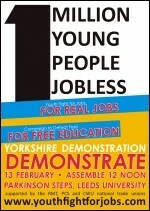 That's the message from employers who put profits before young people's basic rights. Companies, such as the chain '99p Stores' which takes around £300 million a year, are asking people to take no pay during 'trial' periods, writes Ben Robinson, Youth Fight for Jobs. The poor weather conditions did little to diminish the determination of the strikers at North Devon District Hospital last week, writes Jim Lowe. The Office of Fair Trading (OFT) has referred the UK bus industry to the Competition Commission because it has "evidence that limited competition between bus operators tends to result in higher prices and lower quality for bus users", writes Alistair Tice. There is a heavy cloud hanging over Teesside but it has nothing to do with the worst snow for fifty years, writes Ed Hamilton, Teeside Socialist Party. Twinings workers, Usdaw members and supporters are holding a public meeting in Andover to protest at the threat to 400 jobs in Andover and North Shields, writes Nick Chaffey. No to County Council cuts in Warwickshire! A proposed council tax rise of 2.5 per cent, combined with job losses and cuts to frontline services were announced on 6 January by Warwickshire County Council, writes Kyly Wilson, Coventry and Warwickshire Youth Fight for Jobs. Sheffield bus demo: AROUND 70 marchers braved the cold to join last Saturday's demonstration in Sheffield called by We Want Our Buses Back (WWOBB) to protest against First's 8% hike in bus fares, writes Alistair Tice. LAST MONTH, over 130 Israeli Jews and Arabs participated in 'Socialism Conference 2009', held in Tel Aviv in Israel and organised by the Socialist Struggle Movement in Israel, writes Socialist Struggle Movement, (CWI in Israel) reporters. Fujitsu workers say: "Enough is enough"
I spoke to Trevor Palmer, the local workplace rep at Fujitsu Stevenage when I visited the picket line on 11 January, writes Mark Pickersgill, Stevenage Socialist Party. 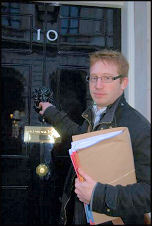 Between 15 and 18 December 2009, the case of four Unison branch officers under threat of suspension from office reached its dramatic conclusion at an employment tribunal, a Unison member writes. WHAT WOULD we do without some comic relief during this big freeze? Fortunately, we have Telegraph columnist Christopher Booker, writes Pete Mason. I was interested to read the recent article in The Socialist by John McInally about the work my union PCS is doing to improve working conditions in call centres in the civil service, writes Paul Newton, PCS rep.
LEEDS CITY council recently announced that they had secured funding for 734 jobs through the Future Jobs Fund, writes Iain Dalton. When the government announced plans to tear up the longstanding agreement on the Civil Service Compensation Scheme (CSCS) they badly underestimated the anger of civil servants at this attack on their contractual redundancy and early retirement scheme, writes John McInally, National vice-president PCS, personal capacity. On 15 January, Sodexo workers at North Devon district hospital finally won their battle for pay rises, sick pay, and a lump sum payment of up to £3,600, writes Jim Lowe. South Yorkshire Fire Brigades Union (FBU) has called a strike for 24/25 January and another from 27 January to 4 February, writes Alistair Tice. THE FIRST crown court non-jury criminal trial in England and Wales has begun, marking a serious departure from a fundamental principle of justice, writes Ray Burr. As part of their 'progressive cuts' agenda, the Liberal Democrats have now backed down from their pledge of abolishing tuition fees, writes Paul Phillips Youth Fight for Jobs student organiser. On the day when the TUC and others write to the government to express their concern that 620,000 people have been out of work for over a year, we hear that Gordon Brown is to expand the army cadet forces in state schools, writes Sarah Sachs-Eldridge. Senan, international coordinator of Tamil Solidarity, spoke at the EU trade committee hearing on 14 January which was held to debate the removal of the special trade preferences, termed the GSP+ concession, to Sri Lanka. 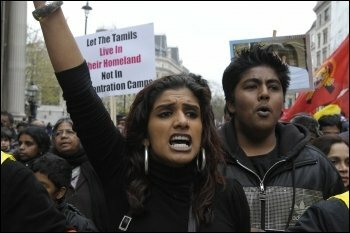 Sri Lanka faces charges of human rights violations. 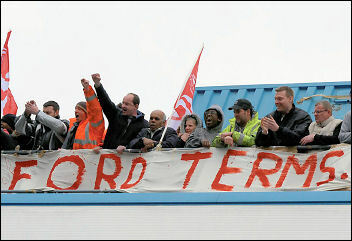 After all the talking, Bosch are closing the plant taking the jobs of 900 workers and their families. Yet again, a multi-national company are moving out of Wales and the UK after years of profit-making at the workforce's expense and millions of Welsh taxpayers' pounds to make even more profit in the low wage economy of Eastern Europe. 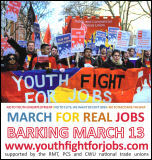 Barking in east London is a deprived area by most measures, consistently facing attacks on services, jobs and homes, writes Suzanne Beishon, Youth Fight for Jobs, London organiser. 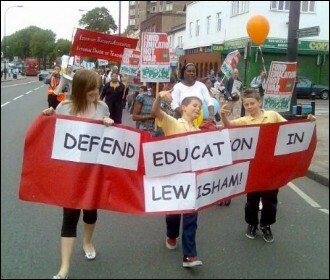 Education trusts are "academies lite"
Education bosses in Greenwich have begun laying off workers and slashing and burning terms and conditions of some of their lowest paid workers, writes Paul Callanan. 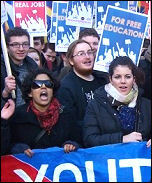 The Russell Group, consisting of the top 20 UK universities has attacked the government's cuts in higher education, writes Matt Dobson, Socialist Students national organiser. 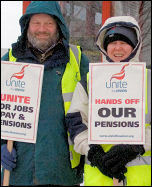 From Vectis buses, to Vestas, to Fords, to Royal Mail and more; on every strike and picket line in Hampshire in 2009 we encountered workers' anger at their employers' attacks, but also their dismay at the failure of the Labour government to give them support, Portsmouth Socialist Party members write. After months of 'warnings', Bosch have announced that they will close their car components plant in Miskin, south Wales, in 18 months' time - and move production to Hungary, writes Mariam Kamish. 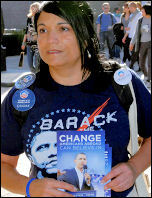 Feature ONE YEAR ago, on 20 January 2009, the largest gathering of people in US history witnessed the inauguration in Washington DC of Barack Obama as president of the United States. For many older African-American workers, this was viewed as the most important political event of their lives, writes Bryan Koulouris, Socialist Alternative (CWI, USA). A Letter from your Postman by Roy Mayall: THIS EXCELLENT short book gives an insight into the current attacks on Royal Mail workers from the viewpoint of an 'ordinary postie'. 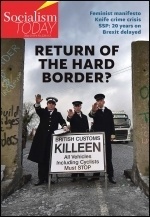 It is not a political polemic or a campaign resource, writes Reviewed by Greg Maughan. 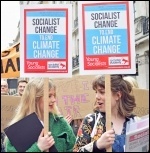 2010 general election appeal: Without money to fund the work of the Socialist Party, the party would not be able to take its ideas to workers and young people, writes Nick Chaffey, secretary, Southern region Socialist Party. About 300 Visteon pensioners from Swansea, Basildon & Enfield along with supporting trade unionists protested today outside the Welsh Assembly building in Cardiff, writes Rob Williams, Socialist Party Wales and Linamar UNITE convenor. Over 120 people, members of community groups and trade unions, attended a meeting called by the Glasgow City Unison branch, writes Ian Leech. "Unless Mr Kasab and his colleagues are punished, black Unison members can have no confidence in the union fighting racism." These were the words of the Unison national officer who acted as the prosecution in the union's case against four Socialist Party members, writes A Unison member. The latest Office for National Statistics (ONS) figures showed a fall in unemployment from September to November 2009 of 7,000, to 2.46 million, writes Ben Robinson. WITH A general election and council elections looming, all the main parties are boasting about the massive level of cuts they will make to public services, the worst cuts in forty years, writes Chris Newby. 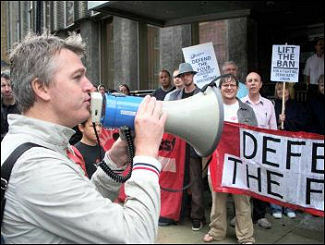 At Cardiff University 112 academic jobs are under threat after a round of cuts was announced earlier this month. Which staff are to lose their jobs is not yet known, writes Edmund Schluessel, Cardiff UCU (personal capacity). The battle between British Airways management and cabin crew intensified in the last week with a series of provocative moves by management in response to cabin crew re-balloting for strike action, writes Neil Cafferky. Around 600 PCS members working for Hewlett Packard (HP) were on strike on 22 January over demands for job security, pay and trade union recognition, writes Ian Fitzpatrick, President PCS Commercial Sector. My new year's resolution was to stop watching TV. This is not for health reasons but because I can't afford to buy a new one if I kick it in while watching the news! Who hasn't wanted to do that recently? The University of Gloucestershire (UoG) is £36 million in debt and plans £3 million of cuts by July 2010, writes Chris Moore. Higher education: Cuts cuts cuts: Last year, Michael Arthur, vice chancellor of Leeds University, announced cuts of £35 million from the university's budget, the equivalent of 700 jobs being lost, writes Iain Dalton, Socialist Students Yorkshire organiser.